The UCSC Wind Ensemble and Concert Choir combine forces to perform a program of masterworks. 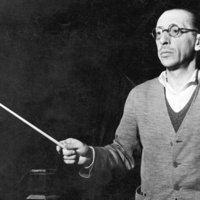 Together, the groups will perform Stravinsky's masterpiece, Symphony of Psalms. The Wind Ensemble will perform Respighi's great pictorial soundscape, Pines of Rome, as well as the explosive finale to Dmitri Shostakovich's 5th Symphony. The concert will also feature the premiere of a new work, Piece of Mind, by graduate student composer Jinwei Sun.